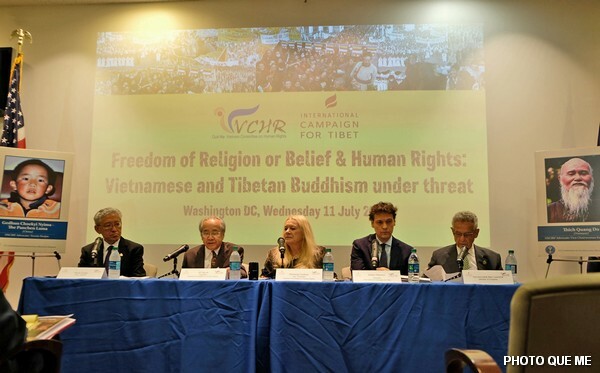 WASHINGTON D.C. 12 July 2018 – VCHR – Vietnam Committee on Human Rights (VCHR) and the International Campaign for Tibet (ICT) organized a Conference on “Freedom of Religion or Belief and Human Rights: Vietnamese and Tibetan Buddhism under threat” on July 11, 2018. 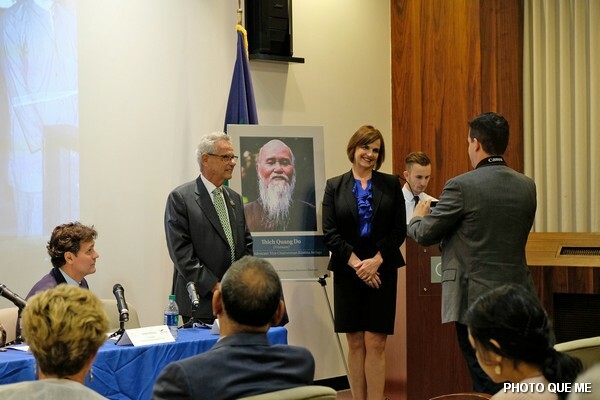 The Conference was hosted by the US Commission on International Religious Freedom (USCIRF) and held at their offices in 732 North. Capitol Street NW, Washington D.C. 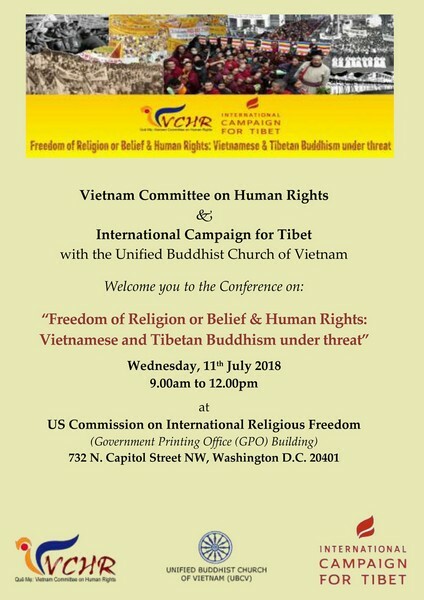 Speakers included Dr. Tenzin Dorjee, USCIRF Chairman, Congressman Alan Lowenthal, Congress-woman Zoe Lofgren, Kristina Arriaga, USCIRF Vice-Chair, Arjia Rinpoche, former abbot of Kumbum Monastery in Tibet and head of Tibetan Mongolian Buddhist Cultural Center, Indiana, Vo Van Ai, President of VCHR, Matteo Mecacci, President of the International Campaign for Tibet, Robert Herman, Vice-President of Freedom House, Todd Stein, Senior Policy Advisor to Representative Chellie Pingree, and experts and human rights defenders from Europe, Asia and the US. The Conference featured two panel discussions on “Religious Freedom and American Foreign Policy”, and “Strategies to Promote Freedom of Religion or Belief in Closed Societies: The Cases of Vietnamese and Tibetan Buddhists.” Speakers explored the importance of a proactive freedom of religion or belief (FoRB) component in US foreign policy; transatlantic and international cooperation in advancing FoRB; violations of FoRB and trade considerations; initiatives to support prisoners of conscience; FoRB and democracy; the role of Buddhism in promoting a civic culture of human rights, dignity and diversity in Vietnamese and Tibetan communities, and beyond. 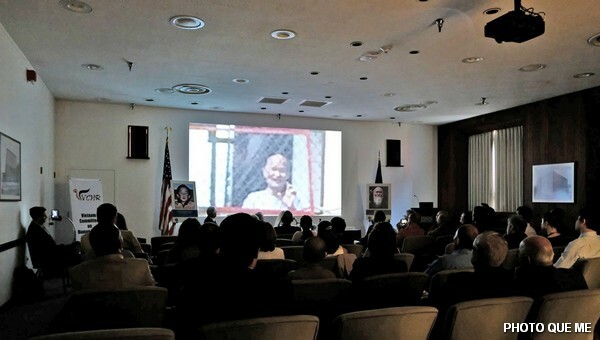 In a messsage sent clandestinely from the Thanh Minh Zen Monastery in Saigon where he is under effective house arrest, UBCV Patriarch said: “Buddhists in Vietnam and Tibet share so much. We walk the same path of nonviolence and peace. We believe that compassion can overcome hatred, and we strive to free the world from suffering, ignorance and oppression. We also share the same punishment, torture and detention from governments that are determined to stifle our voice. “Religious freedom is like a flower. It needs water, sunlight and good earth for its seeds to flourish and grow. Without them, it will die. Without freedom of expression, assembly, association – in brief, without democracy and human rights, religious freedom cannot be guaranteed. This is why we Buddhists keep speaking out for freedom, whatever the price. 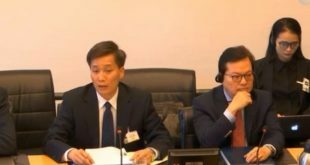 “In Vietnam and Tibet today, the suppression of spiritual values by the communist regimes has led to a rise in crime and violence. Buddhism could contribute so much to addressing these problems and promoting a more caring, tolerant society if only it was free. I wish I was a bird, so I could fly to Washington to be with you today. But I am under house arrest in my pagoda in Saigon. I am isolated, but I am not alone. For I have your solidarity to support and comfort me”. 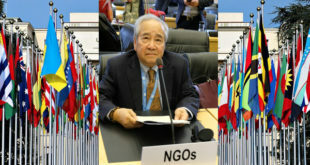 In his Opening remarks, VCHR President Vo Van Ai noted that: “this is the first time Buddhism in Tibet and Vietnam are examined together – the positive contributions of Buddhism, the common policies used to stifle it by the communist regimes, and the real dangers we face if Buddhism is suppressed, not only for our countries, but for the security of the Asia-Pacific region as a whole. 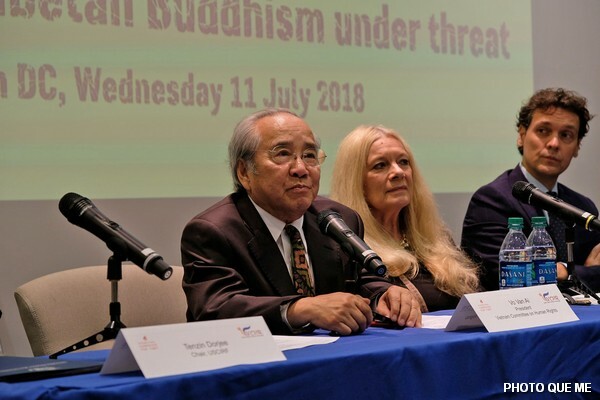 “Vietnamese and Tibetan Buddhism have differences, but there is one thing of which we are all sure – that Buddhism is highly relevant in our modern world. In this year’s message for Vesak Day, which is now recognized internationally by the United Nations, UN Secretary-general Antonio Guterres wrote: “The Buddhist world view teaches us to see ourselves as a part of this world and not as its masters. And Buddhism’s emphasis on non-violence stands as a powerful call for peace. 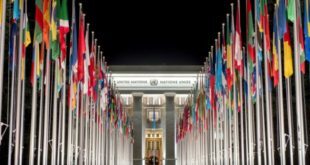 From peace, to climate change, to human rights, we see how much the teachings of the Buddha are so relevant in the work of the United Nations today. Now more than ever, Buddhist communities and all of us must give every day meaning to the Buddha’s message of tolerance, empathy and humanism. We must resist those who seek to twist a call for love into a cry for hate”. “It is true that, over 2,500 years before the Paris Agreement on Climate Change – which certain countries believe is not necessary – Buddha’s teachings included the protection of the environment and the right to life, not just of humans but also animals and plants. As early as the 3rd Century, Buddhist monarchs such as King Asoka set up Edicts exhorting the people to plant trees and respect life; and early Vietnamse Buddhist Sutras such as the “Six Ways of Liberation” (Lục Độ Tập Kinh) taught the principles of liberating the individual, the community and the nation through nonviolent engagement, with such modern concepts as universal education, social equality and ecological rights. “Most of all, Buddhism is a philosophy of peace. All Buddhists practice the Five Moral Precepts (Ngũ giới) which is the Buddhist code of ethics, and the “Six Harmonies” (Lục hòa), six principles for maintaining harmony within a group, based on understanding and mutual respect. In fact, these principles form the very basis of democracy – the respect of diversity and pluralism in all its forms. By developing this spirit of mutual respect, I believe we can create a climate of understanding and tolerance that is vital for our world today. “Indeed, in this era of global terrorism and conflict, a peaceful philosophy such as Buddhism can play a vital role. In Asia, Buddhism is deeply rooted in countries such as India, Japan, Korea, China, Taiwan, Thailand, Cambodia, Burma, Mongolia, Sri Lanka, Vietnam and Tibet. It therefore has immense potential to help maintain stability in the region, and become a driving force for democracy, social justice and human rights. 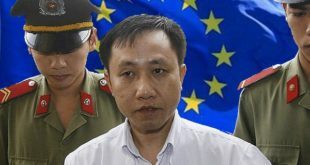 “This is why Vietnamese and Tibetan Buddhism is under threat today, for our governments see it as a challenge. But if the Communists think they can suppress Buddhism by force, they are wrong. 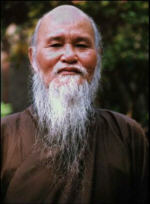 Buddhist teachings are based on two elements – Compassion and Wisdom. We are gentle people, but we resist. For we see reality as it is, and we will not bow down to tyranny. I firmly believe that one day, we shall overcome !”. The full texts of speakers will be published shortly by VCHR and ICT.